Rabbit anti focal adhesion kinase (pTyr861) antibody recognizes focal adhesion kinase, also known as FAK, when phosphorylated at tyrosine 861. Focal adhesion kinase is a highly conserved tyrosine kinase with roles in several biological processes including adhesion, migration and cell survival. FAK consists of four domains, an N-terminal FERM domain; a catalytic tyrosine kinase domain; a C-terminal focal-adhesion targeting (FAT) domain and an unstructured proline rich region between the catalytic and FAT domains. Phosphorylation of FAK at tyrosine 861 regulates interactions with the scaffold protein p130cas and contributes to oncogenic transformation of cells in vitro (Lim et al. 2004). 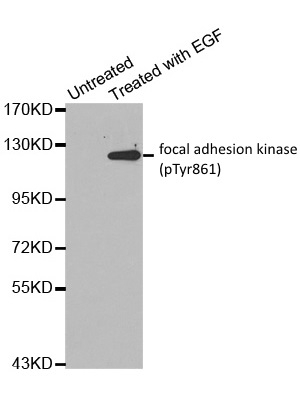 Antiserum to focal adhesion kinase (pTyr861) was raised by repeated immunization of rabbits with highly purified antigen. Purified IgG was prepared from whole serum by affinity chromatography. Lim, Y. et al. (2004) Phosphorylation of focal adhesion kinase at tyrosine 861 is crucial for Ras transformation of fibroblasts. J Biol Chem. 279 (28): 29060-5.